It’s been a while – sixteen long months to be exact. I can only offer that I’ve been so busy that I burned out… I confess. Going to Church was a hit or miss kind of thing and I stabbed at reading my Bible — lots of nights not reading it at all. And there are other events that have occured in my life and my family that have only strengthened the burnout catapulting me into a darker hole. I’m out of everything. Energy. Wisdom. Balance. Overwhelmed, I’ve just moved from day to endless day not knowing what day it was – or is. I’ve been in a mindless fog. I hit a wall. Does this maybe describe some of you? Looking back over the last sixteen months, I can see the devourer at work in my life — and the lives of my family. I have seen an illness nearly take the life of our youngest son. I’ve seen that same illness be misdiagnosed — only to find out it may be worse than what was originally thought. He’s only twenty-eight. I’ve seen the devourer attack another marriage within my own immediate family — and now, I’m not only Standing in the Gap for my own Marriage but the Marriage of one of my own. It was this event that propelled me forward in anger at the evil that has so easily beset my family. It is crystal clear to me that the devil will not just stop at my marriage, but he is now after my flesh and blood. So while I stand, I am teaching another to Stand in the Gap. Before the two Married, I prayed hard that GOD would save this young woman who was to become my Daughter-in-Love. I never dreamed it would come in this manner… Through the cruelty of the devourer who comes only to steal, kill and destroy, this young wife and mother has come to accept Christ as her Savior and the LORD of her life. Praise GOD with me! While learning about the mercy of GOD over her own life, she is learning to Stand in the Gap through faith for the restoration of her young Marriage. In the last four months, I have seen such a dramatic change come over her. Though she hurts, it is so obvious that the power of the Sovereign God reigns in her life. She is faithful to attend Church and praise her GOD. And it shows! The peace and joy — in spite of the ache in her heart — are in her eyes. On her face. She’s beautiful! Radiant! She’s alive! She is also teaching her babies – and I do mean babies — about the Love of God. What an awesome GOD we serve. But in these last sixteen months, I cannot count the times I have asked GOD why? Why is it taking so long? My GOD, my youth is wasting away! The time I can never get back. Less time with my Husband. Time. Gone forever. But yet, here I am. Still. It’s strange to say this, but if I had not still been standing, I could not hold her hand so tightly and walk with her so closely. I would not know where she is in her heart or how she feels or what she thinks… Could she learn on her own? Sure. But GOD uses us. He uses our afflictions — and with the comfort He has given us, we can comfort those with the comfort we ourselves have received. So, dear Stander, do not think the time that goes by is wasted. God in His infinite wisdom and mercy wastes nothing. Nothing. But even in the midst of the burnout and pain, there has been blessing. I have another grandchild — and two more on the way. Can you say t.w.i.n.s?? What a blessing they all are and a sweet testimony to the newness of life — and His goodness and mercy. And since before each has been born, I’ve dedicated each to the LORD’s love and care asking GOD to bring each of them to Him, serving Him and bringing many to Christ for His glory. Can I get an Amen? “Will a man rob God? Yet you have robbed Me! But you say, ‘In what way have we robbed You?’ In tithes and offerings. You are cursed with a curse, for you have robbed Me, even this whole nation. “If I will not open for you the windows of heaven and pour out for you such blessing that there will not be room enough to receive it. “And all the nations will call you blessed, for you will be a delightful land,” says the LORD of hosts. Ok you say. I’ve read that before. Well, read it again. Really take that in. Read each word slowly. It contains some of the languages of a Stander so it should hit a little closer to home. Read it again. This time ask God to open your mind — your spirit. We have a tendency to see only money when we read that. Well, yes. It does involve money but it also involves offerings. They are different. But now ask yourself a question. If you’re robbing the LORD of the money He’s given you the ability to earn, then how do we expect Him to bless us in other areas of our lives?? He can’t! We are cursed because we are robbing GOD! So guess who has shown up? The d.e.v.o.u.r.e.r. And, by the way, it is GOD Himself Who gives us the ability to earn our wages. And you thought it was *you* who has earned your wealth? 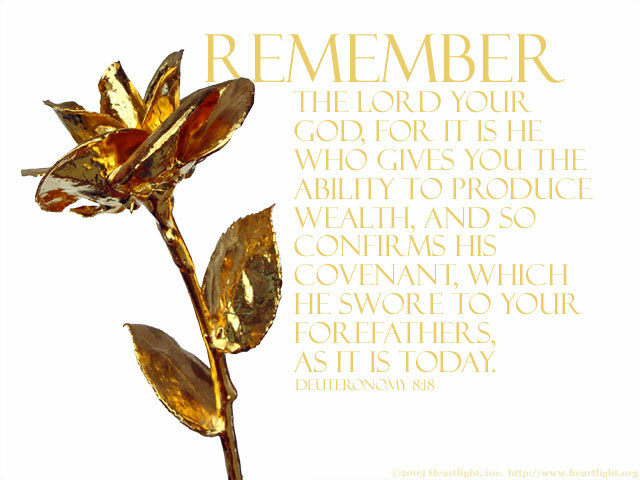 Everything we own comes from the Hand of GOD Who has given us the ability to get what we have! And many of us aren’t giving any of it back! I can hear the skeptics and the pragmatists screaming aloud, “He’s supposed to be GOD! You say He can do anything! Why does He need your money? It’s a get-rich-quick scheme of the Church! It makes absolutely no sense! Giving your money away certainly isn’t going to help you any!” Well, the first thing we need to stop doing is listening to the skeptics and the pragmatists who have no clue Who GOD is, much less any inkling about His Word. No. GOD certainly does not need “our” money to do what He needs to get done. And yes, I will grant you that there are some ‘on-air’ T.V. ministries that constantly cry out for your money, preying on people. Holy Spirit discernment is needed there. But!! What this is really about is what we value first in our lives. What and/or who is first in your life? I can guarantee you for the majority, next to family, it is money! Money! $ $ $ $ $ and lots of it. We covet the ‘almighty’ dollar! So giving it away is a very foreign concept to us. Another point worthy of making here is that we are stewards — stewards of EVERYthing. We have brought nothing into this world and I will guarantee you we will take nothing out of it. So what do we really own? Nothing! When we pass from this life to the next, everything that was in our earthly stewardship passes along to another to care for. Listen. Tithing and offering is a SPIRITUAL Law. It defies human wisdom and conventional bookkeeping practices! Remember the five loaves of bread and two fish Jesus miraculously multiplied feeding five-thousand men — and that didn’t count the women and children!? Tithing and offerings are a part of the spiritual law of the harvest. When we give as this with a willing heart, what we have left is miraculously multiplied! It goes farther than when we try to stretch it on our own. The law of the harvest? We reap what we sow. More than we sow. Later than we sow. But always what we sow. And if we are sowing nothing, we reap nothing. Let me back up for a moment. If I’m going to link tithing to Marriage restoration, ask yourself another question. What do these have together in common — from the temple priests losing all respect for GOD and offering diseased animals on the altar to —> their treachery in divorcing the wives of their youth in order to marry *foreign* women to —> robbing GOD of His tithes and offerings? Eeek! How disconnected that all sounds. Malachi’s appeal was to a backslidden nation; designed to break through barriers of unbelief, disappointment – and even the apathy of the people because the prophecies foretold had yet to be fulfilled. They had been waiting and waiting . . . . and waiting. Sounds sooo familiar, doesn’t it? If we aren’t following closely; if we aren’t looking up and forward to the Blessed Hope, we have a tendency to neglect that Blessed Hope and our attitude becomes one of indifference. In our unbelief, our *actions* literally scream to the world that it’s not worth serving GOD and we walk headlong into moral and/or religious corruption — having a form of godliness but denying the power thereof (ref II Timothy 3:5). And so it was with the people and the priests… Malachi’s appeal through his prophetic word to GOD’s people was for them to stop and recognize that their lack of blessing is not caused by any lack of concern on GOD’s part but rather because of their blatant d.i.s.o.b.e.d.i.e.n.c.e. to the Covenant Law. The priests were wicked and corrupt and the people were disallusioned. They doubted GOD and in their quiet rebellion they began to question the Sovereignty of GOD and His ability to care for and provide for them. Their religion was empty tradition; their rituals, mechanical. It was in this state of disallusionment that they began to rob GOD of their tithes and offerings. And it is here that GOD confronts His people with a series of questions and answers — and it is here in each case that they deny His accusations. Their sinful rebellion colored their perception of GOD resulting in a cold attitude and materialism — which lead them to rob GOD. They gave GOD stolen, lame and diseased animals for the required sacrifice for their sins! They gave a pure and holy GOD that which was blemished — like them — and they expected GOD to bless them anyway! They committed idolatry! They kept the best to themselves. The priests were wicked and corrupt — profaning the Covenant of GOD. The men were divorcing their GOD-ordained wives for *foreign* wives. And the people were robbing GOD of their first fruits — their tithes and offerings, and they wanted to know how GOD was wearied by their rebellion?? Though we are Standers, we must ask ourselves, are our actions saying the same things? Idolatry. It’s what we commit when we hold too close our material possessions over and above GOD — willing to part with none of it; and it is p.r.i.d.e. that expects GOD to bless us in our rebellion. And yet here most of us are actually in rebellion despising GOD’s Name, profaning His Covenant of Marriage, robbing Him of our tithes and offerings — effectively speaking against GOD in our actions . . . . We are “covering the altar of the LORD with tears, with weeping and crying; so He does not regard the offering anymore, nor receive it with good will from your hands. Yet you say, “For what reason?” (Malachi 2:13,14) . . . . and we want to know how we weary Him. We are bringing to Him the leftovers, if anything. Tithes and offerings. Both are mentioned so both must be different. They are. The Hebrew word for tithes is maaser and the Hebrew word for offerings is minchah. Tithes are the first fruits of your income. First fruits denotes the first of your fruits — or your earnings. It is the money GOD has given you the ability to earn. You honor GOD when you take the first ten percent of your fruits — which is what is produced when you work — and He in turn rebukes the devourer for our sakes so that he will not destroy the “fruit of your ground.” The “fruit of your ground” must be different than the “the vine which bears fruit for you in the field” which is also mentioned in the same verse. Hmmm. The Holy Spirit spoke to this Stander as He always does using metaphors. For example, the “land” is used to denote the Standers own home — just like the “city”… The “nations” can be used of the people around you, and so forth. So, through revelation, GOD showed me that He Himself will keep the devourer away from “the fruit of my ground.” Ground is “land” and the “land” is my home! Offerings are that which are over and above tithing. Our offerings are given as the Holy Spirit directs. There may be a special need within your Church that GOD is calling on you to fulfill. This “offering” can be your time and abilities as well. GOD has built within each of us something unique that is needed to serve Him. Special gifts, if you will. Have you read the Parable of the Talents? While talents is used for money, think of it in our terms — abilities. “Therefore take the talent from him, and give it to him who has ten talents. ‘For to everyone who has, more will be given, and he will have abundance; but from him who does not have, even what he has will be taken away. Notice that the first two servants stood before their master with excitement but the third servant stood before his master in fear offering nothing but excuses. He was trying to appease his master by giving him back what belonged to the master along with excuses for not using the talent to the best of his ability. So for offerings? Be faithful in using the opportunities given for service because everything we have — whether opportunities or abilities — belongs to GOD. But whatever your “talents” may be — some teach, others serve — someone may have five talents, someone may have two and still another may only have one, but give them as an offering, holy and pleasing as your sacrifice before the LORD. Here lately, I have been crying out for revelation — what is hindering me from receiving the blessing and desire that I so crave? My answer?? The income I earn has increased but I feel as though I have nothing left! What about you? I feel as though I am struggling sometimes to scrape money for gas or lunch. Before when I tithed, I can honestly and truthfully state that this was not an issue. I also know that my Husband is very serious about his finances and he has absolutely zero tolerance for wanton waste and irresponsible use of money. His bills are always paid first and on time BEFORE anything else comes out of it. And his method of keeping his finances always served us well while we were Married and raising our children. We never went without food or shelter or clothing or transportation. Were we well-to-do? Hardly. Look up the yearly salary of an Airman in the USAF. At the time, it was approximately $11,000 per year. Poverty for one who served his country. And we have a family of four. He still uses that same method of keeping his finances to this day. I said all that only to say this: I also know that my ability to keep my finances in a better manner would honor my Husband as well as GOD. I speak of the change in my heart before my Husband — and I have changed. BUT… and you know there’s always one of those — if I’m not honoring GOD with my finances, then I won’t honor my Husband either. It will continue to be a point of contention between us and that’s not what a restored relationship needs. Aside from ALL that, we must realize that it is our spiritual responsibility to honor GOD first — over and above everything and everybody, including our Covenant Spouse. We are to seek GOD and serve Him with all our mind, body, heart and spirit. That includes our finances and our talents (gifts). There are many, many people Standing in the Gap for the restoration of their Marriages who think they have nothing to give. I do not in any way stand in judgment of you when I say have you considered the widow who gave all she had to give in her tithe? 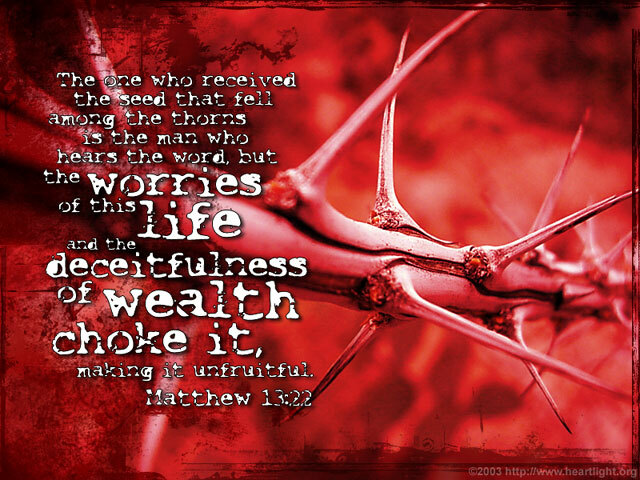 Jesus, Who was standing by the treasury watching the people put money into it — many who were rich put in much. But then the one poor widow came and threw in two mites. Two mites is equal to one-quarter of a cent in the American dollar. Yet she gave all she had! Jesus said they gave of their abundance — or their surplus — but the widow, in her poverty, gave her whole livelihood… (cf Mark 12:41-44) Now that is faith. And GOD forbid that any one of us ever has to give all that we have in faith, but rather may we give willingly of what we do have — and watch GOD bless us in everything. Our employment and our family. May the GOD Who created everything restore the years the locusts have eaten, in Jesus’ Name. GOD says to TEST HIM. Don’t be like the wicked servant who didn’t have much but even with what he had been given, he hid it away. His reward was to be sifted from the sheep to the goats and cast into the outer darkness where there will be weeping and gnashing of teeth. Think about it. Pray about it. Do it. (c) TheEphesianMarriage. All rights reserved.